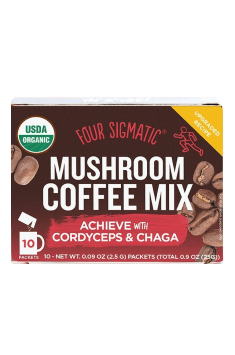 Mushroom Coffee Mix with Cordyceps & Chaga 10 sach. Mix 1 packet with 250 ml of hot water. Despite the presence of extracts from medicinal mushrooms, their taste is imperceptible. The taste of coffee can be turned up by adding a sweetener, vegetable milk or coconut oil or ghee butter for a creamy consistency. Comfort of sachets make it possible to enjoy a healthy energy drink outside of the house, for example when traveling, working, at the gym or at the university. Chaga mushroom (Inonotus obliquus), it is a species of fungus found on the trunks of birch, burl-like appearance, with a cracked surface in different directions, with a cross-section of the black coloured. Contains triterpenes, sterols which are strengthening, improving well-being in cancer, enhance immunity. Applied externally (e.g. to the mucous membranes of the reproductive organs) has anti-inflammatory effects. It also is anti-inflammatory on mucous membranes of the digestive system. Cordyceps sinensis - a mushroom growing in Tibet, of family Clavicipitaceae, for centuries used in folk medicine. Extracts made of have attributed the anti-tumour and strengthening immunity and shielding the liver. effects. It is considered as an aphrodisiac. It improves the exercise capacity and accelerates regeneration of the body after exercise. The supplements containing Cordyceps extracts are used by endurance athletes competition. It is also available in the form of mono-preparation supplement (on domestic market only mono-preparation Cordyceps is the only available substance). Dosage: 500-2000 mg per day. Siberian ginseng (Eleutherococcus senticosus) - an Asian plant in the family Araliaceae. The raw material is the root. Siberian ginseng has the antioxidant, immune-inflammatory, antibacterial, antidepressant and anti-tumour. potential The most important substance indicating biological activity are eleutherosides, supporting the work of the digestive system, lowering LDL cholesterol levels, reducing the risk of pancreatic cancer and supporting sexual function. Siberian ginseng is one of the adaptogens, substances that contribute to the development of immunity of the organism. In the sports supplementation Siberian ginseng is used as a booster for the endocrine, circulatory, immune, nervous systems and as a primary source of adaptogens, enhancing strenuous training, affort at a sporting events or loads of stress. Included in herbal blends (including other varieties of ginseng), increasing testosterone levels, increasing exercise capacity (strength, endurance, aerobic metabolism), as well as it is in the composition of the plant aphrodisiacs complexes. Available at www.muscle-zone.pl. Dosage: in sports supplementation shall be 100 - 500 mg / 24h.